Eastern cicada killers (Specius speciosus) are large, solitary wasps belonging to the family Sphecidae. This species of wasp occurs in the eastern and midwestern states of North America and southward into Central America. There are several other species occurring throughout the United States, including the Pacific, western and Caribbean cicada killers. As indicated by their name, these wasps hunt annual cicadas. Cicada killers rarely sting humans unless someone tries to handle one. However, homeowners may become alarmed because of their exceptionally large size and activity around nesting sites. Males have especially aggressive territorial behavior, but they are incapable of stinging. Females may sting when handled roughly, but typically, they are mild-mannered and will fly away when disturbed. Cicada killers are generally considered beneficial, and control is rarely needed except when wasps are present in unwanted areas. Adult cicada killer male guarding territory. The cicada killer is one of the largest wasps in North America. Adults are approximately 1⅛ to 1⅝ inches long, very robust, with a black body marked with yellow to white stripes. The head and thorax are dark red, while the wings and legs are brownish. Typically, the male wasps are smaller than the females. Their coloration may resemble that of yellowjackets and other wasps or hornets. Their distinct warning colors and loud buzzing make them intimidating to both predators and humans. Adult wasp emergence generally occurs by the first week in July and may continue throughout the summer months. Adults live approximately 60–75 days and feed on nectar and other plant exudates. The males typically die soon after mating. The female wasps prefer to dig new nesting holes in full sun, where well-drained soils exist and vegetation is sparse. They may burrow near sidewalks or patio edges in home lawns. They are also commonly found on sand-based golf course greens and tees or in sand traps, and in sandy playgrounds or volleyball courts. Cicada killer females can cause unsightly soil mounds, often displacing several pounds of soil while tunneling. Each female digs an individual burrow 6–10 inches deep and one-half inch wide. The soil is dislodged by her mouth, and loose particles are kicked back using her hind legs. The excess soil thrown out of the burrow forms a U-shaped mound at the entrance. Some females may nest around planters and flower beds or under shrubs, ground cover, etc. Cicada killers may tunnel as much as six inches deep and another six inches horizontally. The female cicada killer paralyzes her prey by stinging the cicada at the base of the foreleg, and then dragging it to the oval-shaped chamber. She then lays one egg on each cicada in each cell. At the end of the burrow are usually three to four cells where one to two cicadas are placed in each cell with an individual egg. If all the cells are filled, secondary tunnels are constructed and provisioned. A single burrow may eventually have 10–20 cells. The burrows remain open while provisioned by the female. Male cicada killers are very territorial and will approach humans, animals and other males, trying to enter the nesting area. While they may appear aggressive, they are harmless. Typically, eggs hatch in about two to three days. Upon hatching, the larvae begin feeding on the paralyzed annual cicada provided to them. The larvae complete their development in 4–14 days. During the fall, the grublike larvae spin a silken cocoon for protection from the ensuing winter. The larvae will pupate and emerge as adults the following summer. Cicada killers have only a single generation per year. Female cicada killer with captured cicada. U-shaped tunnels created by female wasp during burrowing. Cicada killers are generally considered beneficial, as they feed on cicadas, which can damage young trees. 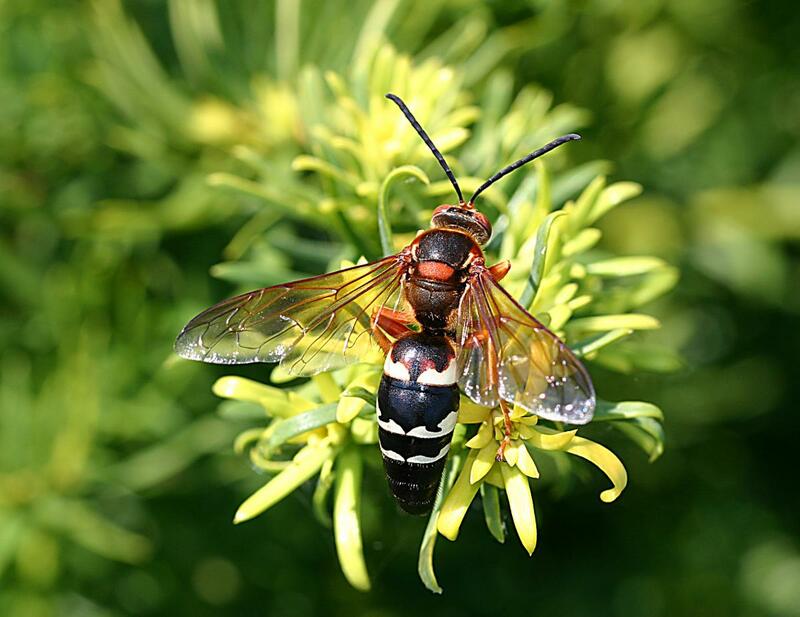 Usually it is not necessary to control cicada killer wasps unless their presence is a nuisance. Sometimes these wasps can be troublesome in high-traffic home and commercial areas such as around swimming pools and golf course greens, tees and bunkers. Sometimes they may fly erratically near people, causing panic. Males may actually defend their territory by dive-bombing people's heads and shoulders! Cicada killers can be hit with a badminton or tennis racket while in flight, or they can be stepped on as they are entering or exiting their burrow. By brushing away the pile of dirt at the entrance of the burrow, the female will become disoriented and won't be able to find her way back to the nest location. If chemical control is necessary, locate the nests during the daylight hours. Treat after dark or before dawn, when female wasps are in their nests and it is cool, ideally less than 60°F. During darkness, use a flashlight covered with red cellophane for lighting. Protective clothing is strongly recommended. One can apply an insecticidal dust onto each nest entrance if the infestation is not too widespread. Do not disturb the burrow, as the wasp must physically contact the insecticide for it to be effective. Sprays are rarely effective because the residue is not sufficient to kill the adults as they walk through the treated area. Repeat treatments may be needed for two to three weeks if new wasps move into the area. At close range, adults can be killed with a wasp aerosol spray. A professional, licensed pest control operator should be used, especially if one is sensitive to stings. Before using any insecticide, always read the label directions. This fact sheet is a revision of HYG-2078A.